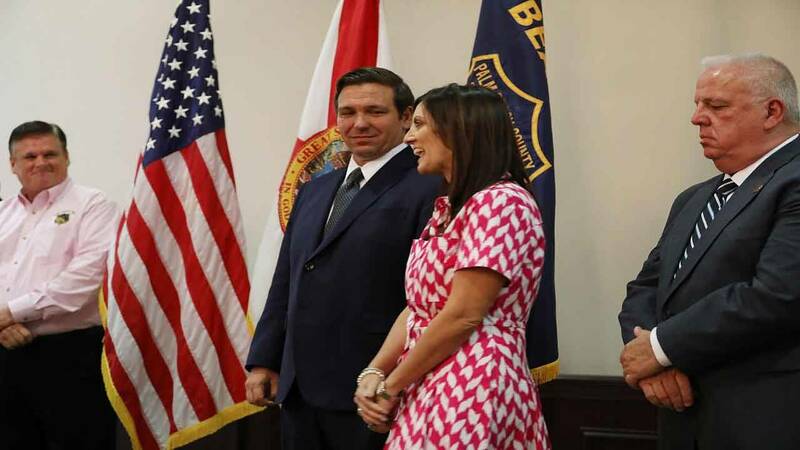 Republican gubernatorial candidate Ron DeSantis and his running mate Jeanette Nunez stand together as they attend an event put on by the Police Benevolent Association in Palm Beach County on Oct. 3, 2018 in West Palm Beach, Florida. TALLAHASSEE, Fla. - Republican Gov.-elect Ron DeSantis announced Thursday he's tapping a former House speaker who backed his primary opponent to be education commissioner and a Democratic state representative to head Florida's Division of Emergency Management. The announcement is a sign that DeSantis, who relied on President Donald Trump to help him get elected, won't make political loyalty a priority as he fills out his administration. Former House Speaker Richard Corcoran backed Agriculture Commissioner Adam Putnam in the Republican primary. DeSantis' campaign harshly criticized Corcoran at the time. "Conservative principles don't matter to career insiders, just deals and dealmaking," DeSantis spokesman David Vasquez said at the time. "That's why we're not surprised to see this corrupt bargain." When told about the statement, Corcoran quipped, "Was it from a studio in New York?" That was a reference to DeSantis spending more time on Fox News than campaigning in Florida. The tone between the two shifted after the primary and DeSantis praised Corcoran on Thursday. "Richard is known as a no-nonsense reformer whose sole focus has been how best to support students, parents and teachers," he said in a news release. "I know Richard will never stop fighting until every child in Florida has access to a world-class education." Corcoran served as speaker the past two legislative sessions. Like DeSantis, he is a supporter of school choice and charter schools. He helped pass a bill that expanded school vouchers for victims of bullying and to mandate that local school districts share property taxes with charter schools. Charter schools are public schools, but they are usually run by private organizations. Corcoran also considered a run for governor, but decided against it and instead backed Putnam, who was considered a shoo-in for the nomination until Trump backed DeSantis ahead of the primary. Corcoran will still need Board of Education approval before replacing Pam Stewart as education commissioner. State Rep. Jared Moskowitz is one of the most outspoken House Democrats in fighting Republican policy. Moskowitz also helped pass gun restrictions after the Parkland school shootings, a bill that DeSantis said he would have vetoed. The Senate will have to confirm his appointment to lead the department that prepares for and responds to hurricanes and other disasters. Moskowitz is a vice president and general counsel at AshBritt Environmental, a disaster response company that has helped recovery in hurricanes, wildfires, blizzards and the BP oil spill. Moskowitz readily admitted he and DeSantis have opposite political views, but said disasters are not a place for partisanship. "The governor-elect made the decision to go with experience over politics and he should be commended for that," Moskowitz said in a phone interview. "This is the department that is going to prepare and respond to people in possibly the worst moment of their life. When someone pulls up to their house in a raft to rescue them because the floodwaters might be rising to their roof, I don't think they check their voter registration." He also said his experience as a legislator will benefit the department as it seeks changes in law to help its mission. "Listen, you can be sure that by picking a legislator as a director of this department, we probably are going to have the largest legislative package ever to come out of this department," he said. "There's lots of stuff that we can be looking at and doing." Corcoran didn't return a call seeking comment.